MICE have continued to breed through summer across many cropping regions in Australia and will reach a peak in abundance in early autumn, coinciding with winter crop sowing, according to the latest survey from the CSIRO. Numbers are particularly high across parts of Victoria and South Australia and are likely to cause damage at sowing. There are moderate populations across southern Western Australia in the Ravensthorpe and Esperance areas; the Eyre and Yorke Peninsulas and North Adelaide Plains in South Australia; southern, central and northern NSW; and the Darling Downs in Queensland. Mouse activity is patchy, but damage could occur. 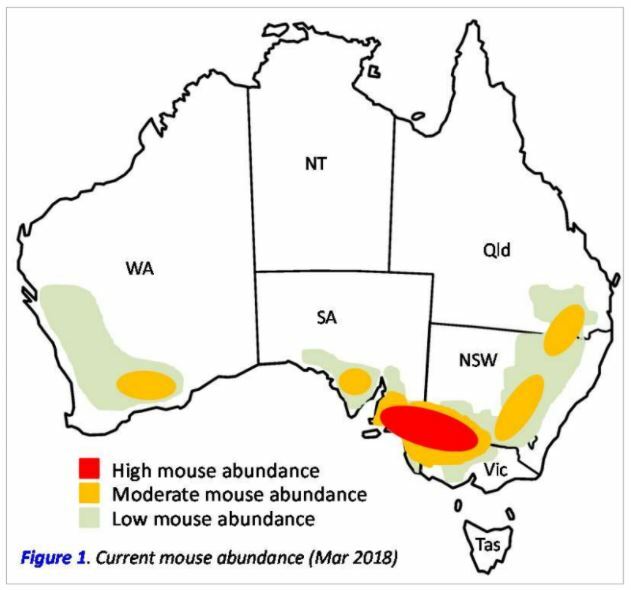 In the latest survey report, CSIRO research scientist, Peter Brown and Steve Henry, said the models were forecasting a moderate likelihood of an outbreak in mouse numbers in north west Victoria through autumn and the potential for them to cause economic damage at sowing in April/May. He said the models were also predicting an increase in numbers to moderate levels on the central Darling Downs in Queensland. “Growers should remain vigilant and act accordingly if damage is likely. Because of patchy activity between paddocks, growers are advised to monitor across multiple paddocks to gauge mouse numbers and inform their management decisions,” he said. Reduce grain residues in stubbles by grazing, prickle chain, small disk chain, speed tilling if applicable to your cropping system. Baiting will be more effective when little alternative food source is available. Consider the application of zinc phosphide bait now and/or at sowing (within 24 hours of sowing/seeding). Manage over as large area as possible to reduce the chance of re-invasion. Communicate with their local bait supplier to understand supply time-frames. Report and map mouse activity using MouseAlert so other growers can see what mouse activity is being observed in their neighbourhood. Follow on twitter using @MouseAlert. Reduce alternative food sources. Prior to sowing, the key is to reduce available food resources for mice; to increase the effectiveness of zinc phosphide baits. Reduce food supply through livestock grazing, prickle chain, small disk chain, speed tilling etc if applicable to your cropping system. A light tillage will help bury food sources making it harder for mice to find food. Apply zinc phosphide baits (at label rate of 1kg/ha). Bait 4-6 weeks prior to sowing and again at sowing if warranted (if high numbers). If mice get a sub-lethal dose, they will develop a behavioural aversion to the bait and not eat it again, thus 4-6 weeks between bait applications. Baiting at 1kg/ha provides around 20,000 lethal baits/ha, more than enough to treat high populations of mice (normally up to 800 or 1000 mice/ha). Reduce cover. Reducing cover (standing stubble) increases predation risk, which means mice will be less likely to forage far from burrows, or they will move to field with more cover. Manage over a large area. Work with neighbours and manage mice over large areas (1000ha) to reduce the chance of reinvasion by mice. The mouse monitoring survey is part of a study funded by the GRDC to monitor mouse populations and forecast the likelihood of mouse outbreaks. This project has been re-funded by GRDC until December 2021.